This is Cascabel and her mom, yesterday, before she got bit. My blog entry today was going to be about the faces of the animals, but I am too tired to be coherent. I took over 80 pictures of the kids sleeping and the faces of the adult goats. I forgot to mention that the little kid that got bit by a rattlesnake received her name, "Cascabel". It is the Spanish word for rattle, as well as the name of a chili plant, so it fits my desert trees and plants theme. Won't be hard to remember her name! 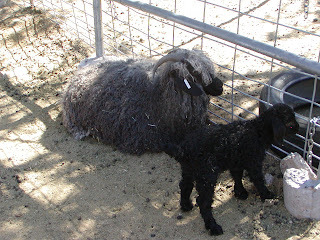 Palo Seco was allowed out of his pen with his mom, since the other baby needed to go in. He follows me around, so I feed him and Desert at the same time. Desert is jealous and thinks that all of the bottles should be his. He was springing and chasing the other kids tonight, so I shoved him out in the area with the llamas. Brillo and Oreo thought it was great and chased him like he had been doing to the kids. He was too tired, when I let him back in, to mess with anyone else. I might do that on a regular basis. He has no real playmates and is too big to be safe with the little ones. He needs to release energy.